We are so pleased to announce that the FHFF Oscar Gala returns to the beautiful Friday Harbor Yacht Club for 2019. 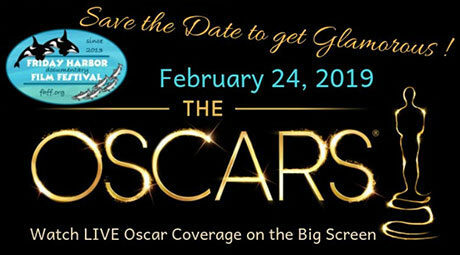 Watch the Oscar Ceremony LIVE on the Big Screen on Sunday, February 24th, 2019. Join with FHFF, as we host the 3rd Annual Oscars Fundraiser Gala! Celebrate film and watch the Oscars live on the big screen with your friends! Doors open at 4:30 pm with live Red Carpet Coverage on the big screen, followed by the Oscar Ceremony at 6:00 pm. Enjoy a wonderful selection of gourmet tapas prepared by fabulous local chefs accompanied by an assortment of alcoholic and non-alcoholic beverages. Choose to dress in your glamorous best, or get creative and come in costume as a film character or actor/actress. Whatever you wear – it will certainly be a fun-filled evening. Begin with cocktails and our Silent Auction. Choose from a wide array of adventures, dinners, travel packages, gift certificates, and more. Mayor Farhad Ghatan hosts our Live Auction bidding, which takes place during commercial breaks of the Oscar telecast. There will be something of interest for everyone. Tickets are available online [CLICK HERE] OR come into our office at 10 First Street, OPEN Tuesday – Saturday 1-5 pm. Tickets are $75 per person; $140 per couple. Join us for a fun-filled evening and Support Your 7th Annual Film Festival in 2019!